County Championship leaders Middlesex dominated Lancashire on day two to move closer to a first title since 1993. Lancashire were reduced to 6-4 and 32-5 before recovering to 102-5, still 225 behind, when rain and bad light ended play 28 overs early at Old Trafford. 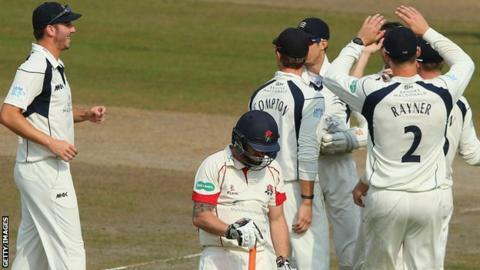 Middlesex earlier lost seven wickets for 65 runs to be bowled out for 327. If Middlesex win and Somerset beat Yorkshire at Headingley, Middlesex will need four points from their final game against Yorkshire to become champions. Whereas the visiting batsmen benefited from some loose Lancashire bowling on the first day, the Middlesex attack made perfect use of the new ball and the movement offered from the surface to rip through the home top order. Toby Roland-Jones, constantly asking questions with a full length, had England prospect Haseeb Hameed caught at second slip without scoring, before Tim Murtagh induced an edge to gully from Luke Procter. Roland-Jones then had Alviro Petersen held down the leg side, despite the batsman's protests, and yorked Steven Croft two balls later to leave the hosts in disarray at 6-4. Jos Buttler briefly sparkled, but when he was brilliantly caught down the leg side by John Simpson to give Roland-Jones a fourth wicket, Lancashire were 32-5. It was left to Rob Jones, in only his third first-class match, and Liam Livingstone to rebuild in an unbroken stand of 70, occasionally aided by light only good enough for Middlesex to bowl their spinners. When the weather intervened for the final time, Jones, solid in defence, was unbeaten on 42 and Livingstone 31 not out. The collapse came after an improved bowling display by Lancashire, with Kyle Jarvis and Tom Bailey making inroads with the second new ball and spinner Simon Kerrigan running through the lower order. Overnight pair Dawid Malan (53) and Stevie Eskinazi were bowled by Bailey and Jarvis respectively before Bailey had Simpson caught at second slip. Kerrigan, who struggled on the first day, showed a greater consistency of length to find turn and some uneven bounce, removing Ollie Rayner, Roland-Jones and Steven Finn in figures of 4-80.